Thian Hock Keng is one of Singapore’s most majestic Chinese temples. It was built when Telok Ayer Street was a sandy beach crowded with trading junks, long before the first land reclamation that began the inexorable separation of the temple and the seashore. The temple was built in traditional southern Fujian architectural style. There are three distinct parts to the complex, each with its own entrance. In the centre is the temple itself. To the right is a long narrow plot containing the premises of Keng Teck Huay (庆德会). To the left, is a square compound that houses Chung Wen Ker. The temple adheres to the Chinese principle of axial symmetry. There are three halls – entrance, main and rear – that are built slightly raised podiums to underscore their importance. These are positioned along a central axis and separated by courtyards lined with single-storey buildings. The exposed beams and cantilevered brackets are richly carved with heroes at war, sages on horsebacks, saints on clouds and patterns of flowers and animals, all enhanced with lacquer glided with gold. The temple’s rooftop is its crowning glory. It consists of curved ridges, elongated eaves with upturned min nan (闽南) (Southern Fujian) “swallow tail” end sweeps and generous ornamentation. 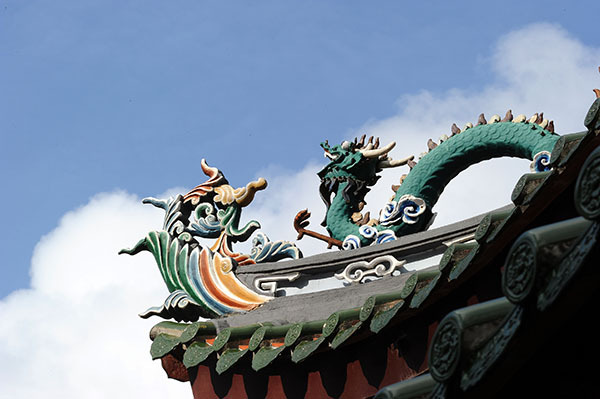 Surmounting the Entrance Hall roof are a blazing pearl and four dancing dragons. These dragons symbolize strength, justice and authority and they are shown striving towards the perfection of ideas and concepts as represented by the pearl. It is interesting to note that among such traditional temple architecture, there are several electric European decorative touches from the glazed ceramic tiles that form the dado (the lower part of the wall specially decorated) on the exterior wall to the cast iron railings along the front of the temple. 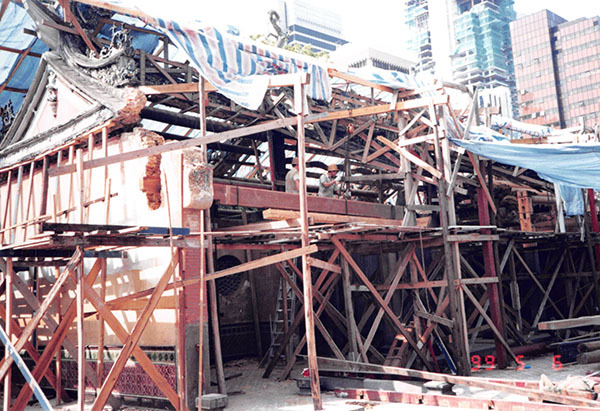 Over the last few decades, Singapore Hokkien Huay Kuan has funded more than $6.5 million for the restoration and repair works of the monument. 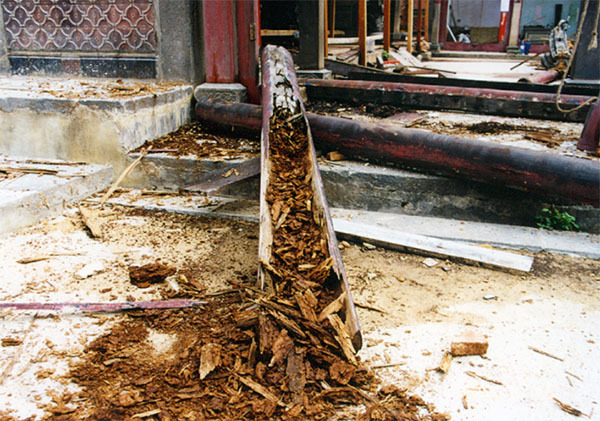 This excludes maintenance costs incurred annually. 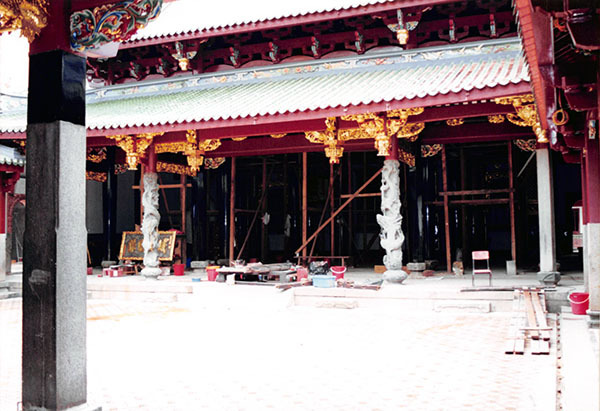 The construction of Thian Hock Keng signified the transformation of an immigrant society to one that had its roots planted solidly in Singapore. Today, Thian Hock Keng transcends race, religion and dialect boundaries. Its visitors and worshippers come from all over the world and all walks of life. It is a rare “living” monument that reflects our society and development. It is apt to describe Thian Hock Keng as an oasis for all in modern-day Singapore. Join our guided tours to find out more about the history and architectural significance of Thian Hock Keng. An iconic national and cultural treasure that reflects the ingenuity and creativity of our forefathers. The century-old architecture continues to be an inspiration for many.